Alexander McDonald was born on May 2, 1869 in Ontario. His father was Angus McDonald and his mother was Catherine McPherson. He married Sarah McDonald on July 1, 1984. In 1895, Alexander McDonald purchased River Lot 8 in St. Albert, where he built the family house and barn. Alexander’s brother, Duncan George McDonald, also moved to St. Albert and purchased River Lot 9. Alexander and Sarah McDonald had four children: Christina (Tena) Catherine, Romeo (Romey) Alexander, Jeannette Anne, and Angus. Alexander McDonald passed away on December 28, 1940 and Sarah McDonald passed away on March 24, 1945—both are buried in the St. Albert Cemetery. Christina (Tena) McDonald was born on July 18, 1896. She worked as a nurse at the Innisfail Hospital in the 1940’s and worked as a nurse’s aide at the St. Albert Youville Home in the 1950’s. 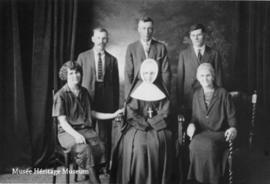 She also worked for a short time for the Sisters of the Assumption in Battleford, Saskatchewan. She retired to the Youville Home in 1979, and passed away on October 1, 1983. Romeo (Romey) McDonald was born May 8, 1898. On July 11, 1934, he married Kathleen McDaniel, born on July 2, 1907 in Belfast, Ireland, to Patrick and Bridget McDaniel. They had eight children: Patrick Alexander (b. 1935), Brian Donald (b. 1936), Desmond Joseph (b. 1938), Frank Anthony (b. 1939), Jeannette Bridget (b. 1942), Kevin Emmet (b. 1944), Sarah Alexandra (b. 1946), and John Gerald (1947). The family lived on River Lot 8. Romeo McDonald passed away on February 17, 1982 and Kathleen McDaniel passed away on April 11, 1983. Sister Jeannette McDonald was born August 31, 1902. In 1923, she entered the novitiate of the Sisters of the Assumption at Nicolet, Quebec, and became known as Sister Marguerite d’Ecosse. She taught in in schools around Alberta and Saskatchewan from 1926 to 1968. In 1977, Sister Jeannette retired to the convent in St. Paul, but entered the Youville Home in St. Albert following a stroke. She passed away on March 2, 1983. Angus James McDonald James was born June 7, 1905. He married Cecile Veness in February 1938 and they had two children, Joan and Donald. Cecile Veness was born on July 13, 1909 to Walter Veness and Rose Anna Leonard. Both were involved in the St. Albert community. Angus McDonald was a member of the Lions Club and the Knights of Columbus. Starting in 1958, he also served as a trustee for the St. Albert School District No. 3, and he later became chairman of the Board of Trustees until 1961. Cecile Veness belonged to the Women’s Institute, the Altar Society, the Catholic Women’s League, and the St. Albert 4-H Clothing Club.